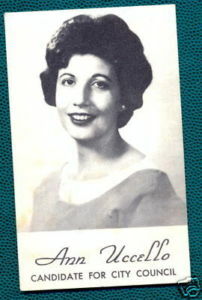 Former Hartford Mayor Antonina “Ann” Uccello is celebrating her 90th birthday today. Uccello is known to the younger generations for the I-84 highway signs that direct people to the downtown street in her honor, but many remember her trailblazing tenure at city hall nearly a half century ago. Her name is frequently mentioned when anyone talks city politics, because she was the last Republican elected mayor of Hartford. That is an electoral drought that has become a source of great frustration for the GOP. 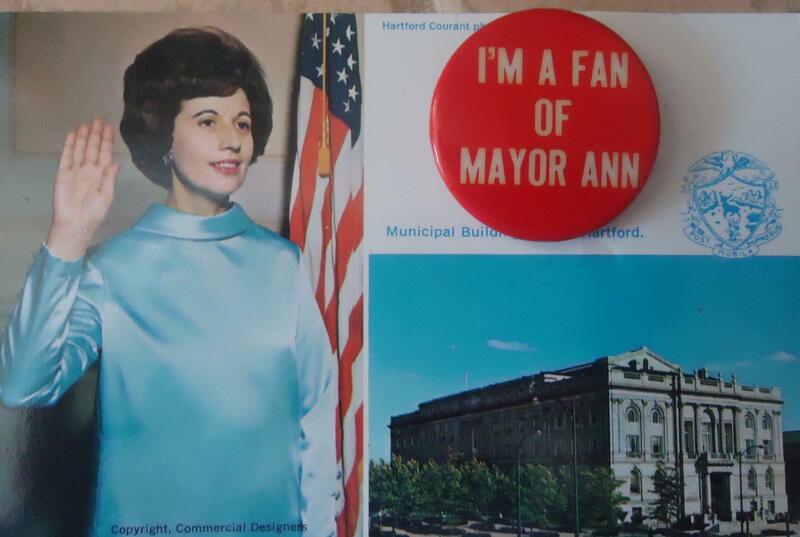 Back in 1967, Uccello was not only the first woman elected mayor of Hartford or in Connecticut for that matter, but also the first woman elected mayor of an American capital city. The news was so significant, it made headlines around the world, even in Moscow. 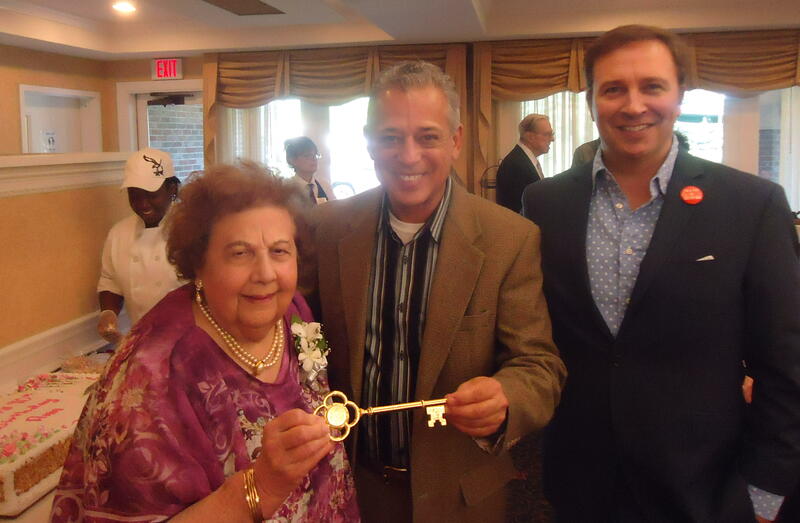 Today at a party with 100 of her friends and family, Uccello was presented a key to the city by current mayor Pedro Segarra. Segarra told the crowd this pioneer broke down barriers in place for more than 200 years, paving the way not only for other women, but also for blacks and latinos like him. Countless women entered politics because of her. Nancy Johnson once said she was inspired by Mayor Uccello to run for congress. By the way, that pin that I am wearing in the picture? That was a campaign button from Uccello’s successful re-election race in 1969. She gave it to me when I first interviewed her back in 2006. Among Uccello’s accomplishments: going into the north end to talk personally with rioters in 1968, thwarting developers who wanted to raze the Old State House for a parking lot (can you even fathom someone proposed that?) and encouraging planners designing the Hartford Civic Center to make it larger to perhaps one day house a professional team. The Whalers showed up in the mid 70s. In 1970, Uccello was the favorite in the race for the GOP nomination for the U.S. Senate seat held by a then unpopular Thomas Dodd. On the urging of President Nixon, Uccello passed on the senate dream, and decided not to challenge Lowell Weicker, and instead run for congress. She lost that heavily Democratic first district race. 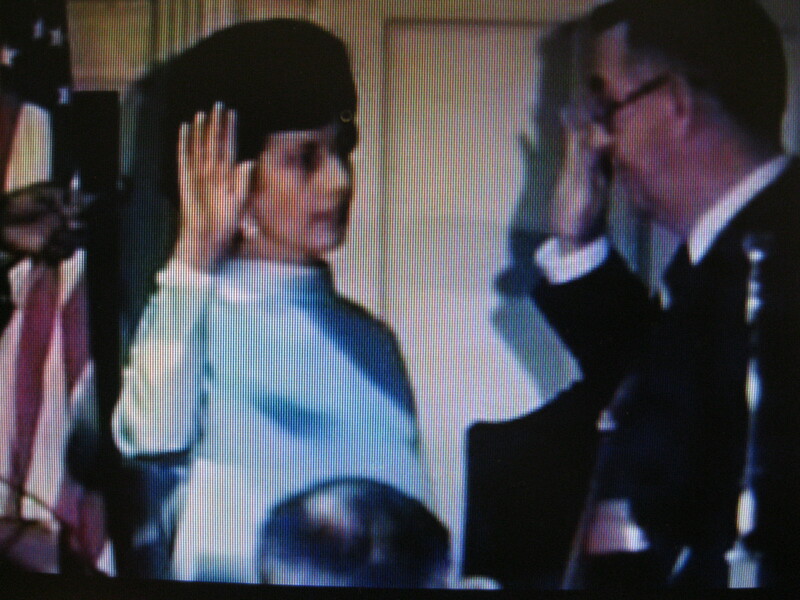 Nixon promptly gave her a job in the Consumer Affairs Division of the Department of Transportation, a job she remained in through the Ford administration. By the way, the party today at the retirement village where Mayor Uccello lives is apparently just part of her 90th birthday celebration. She told me she wants to go out to celebrate….at the Russian Lady, right on Ann Uccello Street. Hats off to her. We could use someone like her today to help salvage the damage done to Hartford by 40+ years of Democrat rule. Thanks for this article. I frequently see the sign on I-84 but never knew who Ann Uccello was.Growing up during Ella Grasso’s time, I always admired her accomplishments, and her advancement of women, particularly Italian-American women. Now I see that she indeed had a distinguished predecessor. Kudos to Ann Uccello, and Hartford for naming this very public street after her. P.S. Also have great memories of the Russian Lady- glad to see it is back. Truly a great lady, serving at a time when manners were considered necessary for politics and a pride not only to her father but to all Italians in the state. If Ella Grosso was the iron fist — and my Windsor Lock family knew her well — Ann was the velvet glove. Ann is a very classy lady. I met her first only a few years ago when she was getting ready to move and she was selling some of her books. Ann had many inspiring political stories to tell – perhaps planting some seeds leading to my own political involvement. Happy Birthday, Ann – and may you have many, many more!